On the night of Jan. 2, the Chang'e 4 mission softly touched down inside the 115-mile-wide (186 kilometers) Von Kármán Crater, which lies within the huge South Pole Aitken Basin in the moon's southern hemisphere. China's state-run Xinhua news agency reported that Chang'e 4 is equipped to measure the moody moon's big temperature swings. "Without our own data about lunar temperatures, we don't know how cold a lunar night can actually be," Zhang He, executive director of the Chang'e 4 probe project from the China Academy of Space Technology (CAST), told Xinhua. Tan Mei, a Chang'e 4 consultant from CAST, said the lander will switch to a "sleep mode" during the lunar night due to the lack of solar power, and rely on a radioisotope heat source to maintain warmth. This power supply is the product of collaboration between Chinese and Russian scientists. "We need to transform heat into power to run the thermometry to measure the temperatures of the lunar surface at night," Tan said, according to Xinhua. 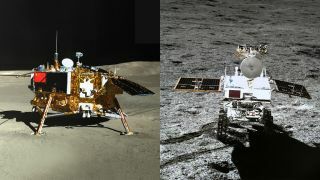 The lander is equipped with dozens of temperature collectors, and the data they collect at night will be transmitted after the probe is wakened during the moon's daytime, said Li Fei, a designer of the lander from CAST. As reported by Xinhua, Sun Zezhou, the chief designer of the Chang'e 4 probe from CAST, said the probe will get first-hand data by directly measuring the temperatures of the lunar soil, the probe's surface and its key interior equipment during the lunar night. Used for the first time in a Chinese spacecraft, the isotope thermoelectric generation technology on Chang'e 4 is a prototype for future deep-space exploration missions, Sun said. In 2013, China launched Chang'e 3, the country's first spacecraft to soft-land on the moon. (It touched down on the near side; Chang'e 4 is the first craft ever to land on the far side.) The scientific instruments on its lander are still operating after more than 60 lunar nights in the past five years. In May of last year, China sent a relay satellite, named Queqiao (which means "Magpie Bridge"), to the halo orbit around the second Lagrangian point of the Earth-Moon system to set up a communication link between the Earth and the moon's farside. It is the first communication satellite to operate in that orbit. According to Xinhua, Chinese space experts hope Queqiao will be able to assist other countries that intend to send probes to the far side of the moon within the relay spacecraft's life span. China's lunar exploration will continue with Chang'e 5, which is expected to bring samples of lunar soil back to Earth. China aims to launch Chang'e 5 later this year. You can learn more about the Chang'e 4 mission and outreach to other nations in this New China TV video, which was posted on Jan. 13.